every night (including Christmas Eve, Christmas and New Year’s Eve. Walk‑thru Display – All abilities accessible. Open Garden House with hot cider, punch, coffee and cookies! Information & Gift Center Open every night! 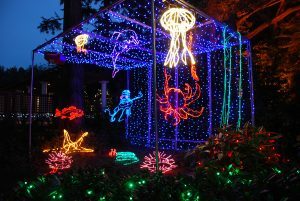 During the 2017 season, an estimated 74,392 visitors viewed the lights display and enjoyed the refreshments in the beautifully decorated Garden House and the entertainment in the Performance Pavilion. The brightest and most beautiful place on the West Coast shines as brightly as ever this season. Parking fee: $5 per vehicle or current OPRD Annual Parking Pass or Coastal Passport or current OPRD Campground Receipt or current Special Access Pass. No additional charge for lights viewing. 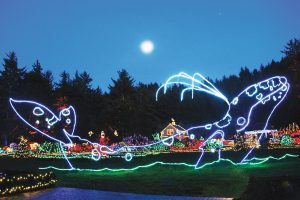 LIGHT SCULPTURES: Pelicans, Puffins, Jellyfish, Shore Acres= Cranes, Life‑size leaping Orca whale, Life‑size spouting Gray whale, Tulips, Rhododendron, Rose, Dahlia, Dungeness crab, Sea Star, Sea Urchin, Sea Anemone, Sea horse, Octopus, Kelp, Mushrooms, Frogs, Butterflies, Dragonfly, playful Sea Lions, Leaping Frog in pond, Ship, Fuchsia flower and animated Hummingbird, Koi carp, Lighthouse, animated Bumble Bee, Porcupine, Raccoon, Deer and Rabbit, Shasta Daisies and Ladybug, animated Seagulls and Crabs, a New animated Orca Display (2016), a New animated Dolphin Display (2017) and more! A community tradition was born in 1987 when the Friends of Shore Acres decided to Astring a few lights@ to help celebrate the holidays. That first season, 6,000 miniature lights, one Christmas tree, and the decorated Garden House drew 9,000 visitors. Now, at least 325,000 lights (mostly LED), 30 large landscape lights, dozens of small landscape lights, 30 large holiday trees, dozens of lighted sculptures, entertainment in the pavilion, and a beautifully decorated Garden House draw B on average B 40,000 to 50,000 visitors each season. Numbers vary with the weather. Inside the Garden House, scrolls of names are a tribute to business supporters, members and the more than 1,500 volunteers who make it happen. 2008: More LED lights and surprises! 2007: More LED lights including L.E.D. rope lighting on the 45’ whale sculpture. 2003: New entry and deck and a new Information and Gift Center (IGC) greet you as you enter the Gardens. Both the entry and IGC reflect the original designs of the early Simpson Era. Animated leaping frog in pond. 2002: New Pavilion for musical and vocal presentations. 2001: Animated sea lions and additions to the undersea garden.